Thank you to the wonderful http://www.frogttenmeadows.wordpress.com Neha’s site has beautiful and inspirational poetry that always brightens my day. 1). 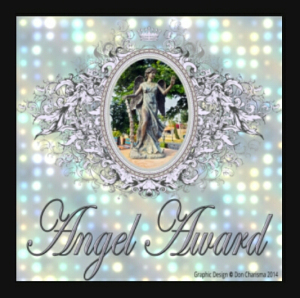 The nominee shall display the Angel Award Logo on his/her blog. 2). The nominee shall nominate ten (10) other blogs/bloggers to bestow the award to and link to their blogs and inform them about it! 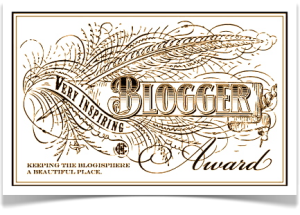 Thank you to the fabulous Emily at www.bumblesbooks.wordpress.com for nominating me for the Inspiring blogger award. She is a talented novelist and a witty blogger, if you aren’t following her blog – well, what are you waiting for. 3. Describe three things that have inspired you recently. 6. Proudly display the award logo on your blog and follow the blogger who nominated you. I drink a cup of tea every night. I’m a chocoholic, but I don’t eat chocolate I just really, really want to. I like to make up new words, I really dooso. http://catalyticview.com This is a new blog that I’ve recently started following, but I love his photography and his writing is personal and beautiful. www.interestingliterature.com this blog has lots of facts and stories to do with the world of writing. It’s a lot of fun and I enjoy having poke around when I need a quick entertainment fix. Yay! How exciting to have Bookgirl nominated for a Liebster award. Another blogger describe it as a “Virtual Hug”; I like that. I wish to thank fellow blogger http://ejmcgrorey.wordpress.com for nominating me. You are wonderful! It ‘s is so nice to have people say I’ve read and liked what you’ve written. The Liebster award is a way to spread the word about new blogs you love, so I’ve joined the list and I hope to share with you some fantastic blogs and some random facts about moi! What’s the best advice you’ve ever been given on blogging/writing? Robbie Williams with the added support of Duran Duran -bonus! That I was Buffy, slaying evil vampires – oh, you mean that type of dream. I’m at the Academy Awards giving my much rehearsed acceptance speech for best screenplay. What’s the best TV show you’re currently watching and why? I still love The Amazing Race. I would love to go on that show. Except if they have a gross eating challenge then I’d have to hand that over to my partner. I have a strange compulsion where my hand has its own free will and makes lots of scribbles on pieces of paper; it’s a condition really. No piece of paper can be left blank. When was the last time you wrote a letter and who was it to? Yesterday. It was to my son’s teacher. This alone keeps stationary makers in business. On the weekend, if you’re not writing, what are you usually doing? This is allocated family time. I’m all theirs. Neither, they are both evil conglomerates haha. 10. If you could go anywhere in the world tomorrow, where would you go and why? Harry Potter world, I have a few spells I’d like to cast. Next 11 Random facts: Hmmm if you go to my about page I’ve already shared 7 so therefore i owe only 4. 1. My eyes are sometimes blue, sometimes green. 2. I find the reality shows “The Housewives of… ” a fascinating anthropological study. 3. I’m obsessed with the traffic report. 4. I’m a girl who hates shoe shopping. I love this blog because she post beautiful poetry that brings sunshine to my day. I nominate this blog because her words come from the heart and i always appreciate what she has to say. Cat is a talented and generous writer and her posts are always a highlight of my week. Love FictionFans blog, excellent reviews with entertaining writing and pics as well. I nominate Lakmi for her meaningful words, that are both touching and beautiful. 1. Name the superhero power you would most like to possess. 2.Which author, alive or dead, would you like to meet? 3. What book was your favourite as a child? 4. Which book do you wish you wrote? 5. Have you always wanted to be a writer? 6. If you had to choose another occupation what would you be? 7. What’s your favourite genre? 8. What was the worst book to film conversion? 9. What was the best book to film conversion? 11. Have you enjoyed the blogging experience?